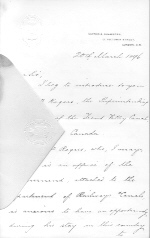 Richard Birdsall Rogers obtained several letters of introduction in Canada and after one previous attempt at taking the steamer for Europe, he embarked on his trip on February 15, 1896. Once there, Rogers arranged several interviews to see the sites of several locks. In some instances the authorities found time to show him around the premises and allowed him to get first-hand knowledge which would later prove invaluable when he took charge of construction of the Hydraulic Lift Lock. In other cases, the authorities were too busy or out of town. It was then that Rogers found alternative ways to see the sites and learn on his own. 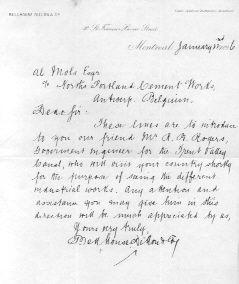 A complete description of the Trip to Europe can be found in Rogers' 1896 Diary. 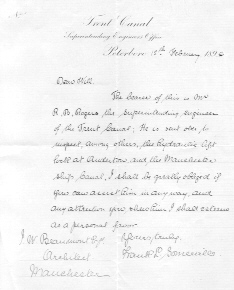 There are many letters of introduction provided to Rogers in the collection. 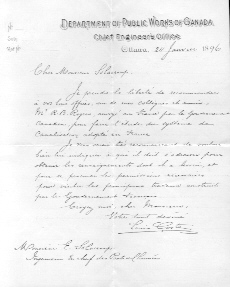 We have chosen a few representative letters and reproduced them below. (Antwerp, Belgium)... signed Bellhouse Dillon & Coy.